FINANCIAL EXPRESS: The $1-billion online grocery space is all set for the big battle with deep-pocketed players signalling expansion and strengthening their online grocery operations. It is not just Amazon; Walmart’s recently acquired 77% stake in Flipkart could lead to a larger focus on the food and grocery segment, currently led by Bigbasket with 37-40% market share, followed by Amazon and Grofers and Flipkart. In fact, grocery is touted as the fastest growing segment within e-commerce. According to RedSeer Consulting, it is growing at a CAGR of 60-70% and is expected to touch $4-5 billion in 2020. 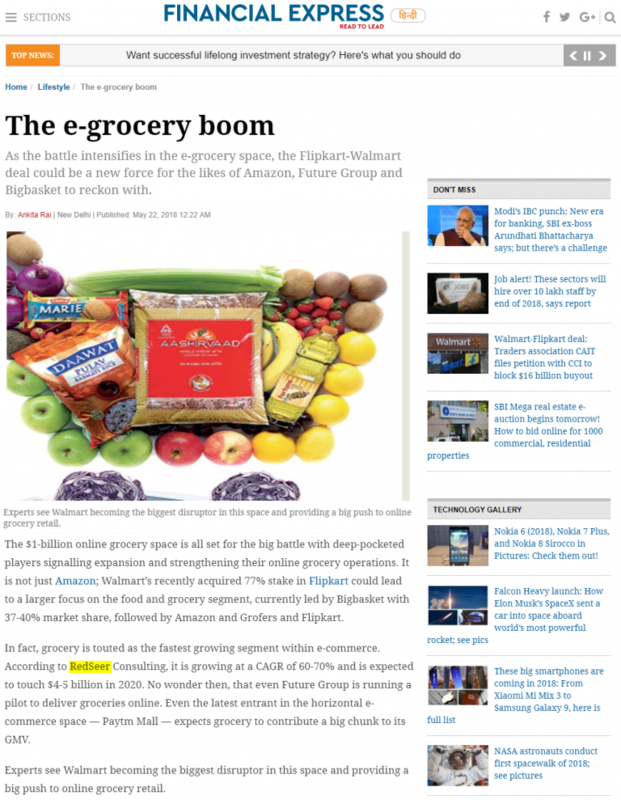 No wonder then, that even Future Group is running a pilot to deliver groceries online. Even the latest entrant in the horizontal e-commerce space — Paytm Mall — expects grocery to contribute a big chunk to its GMV. Experts see Walmart becoming the biggest disruptor in this space and providing a big push to online grocery retail.